McDonald’s app McD has been released one year ago in San Francisco and has expanded in December to St. Louid and Boston and is now testing in 1,000 stores. 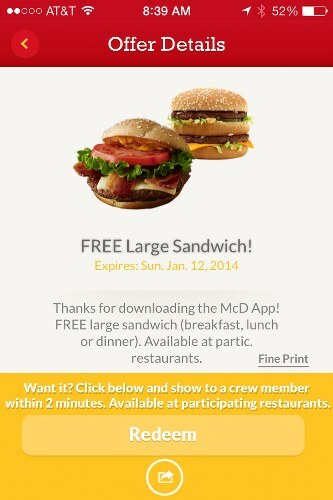 McD app informs users about special deals, such as „buy a breakfast sandwich get one free or $1 Hot ‘n Spicy McChicken sandwich. Users can download this free app anywhere they want and can specify what kind of deals they want to receive but deals are valid just in testing stores.